Whenever we start looking at a new idea of my son’s, I like to equip him with some vocabulary that is specific to that theme, which he’ll be able to build upon and use as we learn more together through play. 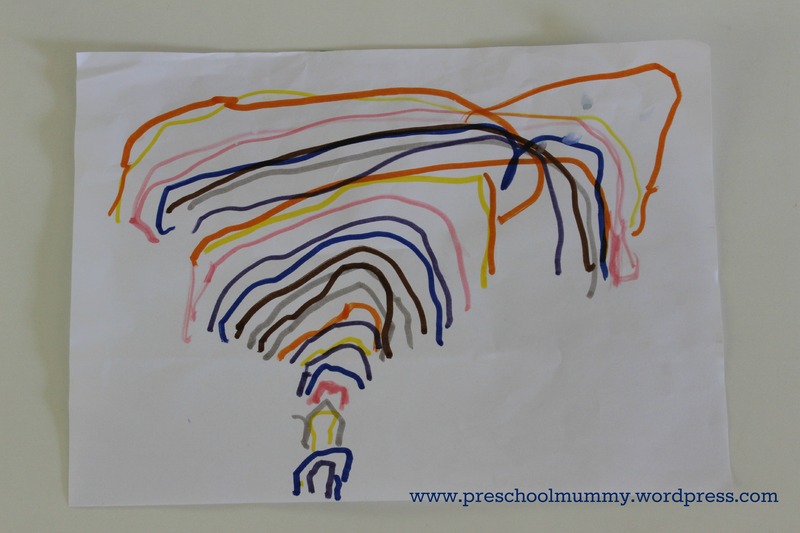 As we looked at his magnificent rainbow drawing, we chatted and I casually asked him to tell me the colours he’d drawn, whether he’d missed any, if they were in any order, how he’d chosen the colours. In answering these questions he showed me that he knew all of the primary and secondary colours, he could identify that he was missing some, and that he had a preference for certain colours and had used his “favourites” rather than the known colours of the rainbow. This is what we teachers call “assessing prior knowledge”. All children come into new learning environments (a classroom, a museum, a park, the dentist surgery) with prior knowledge, and it’s so important to acknowledge that and use it as a foundation for future learning. Our conversation showed me there were gaps in his knowledge, and this is exciting, because it means we get to go about learning more together. He didn’t know that rainbows always have the same colours, in the same order, or that there were special names for dark blue and purple (which he called them), which are of course, indigo and violet. We had a quick look on Google Images of rainbow pictures and I waited to see if he’d see a pattern. 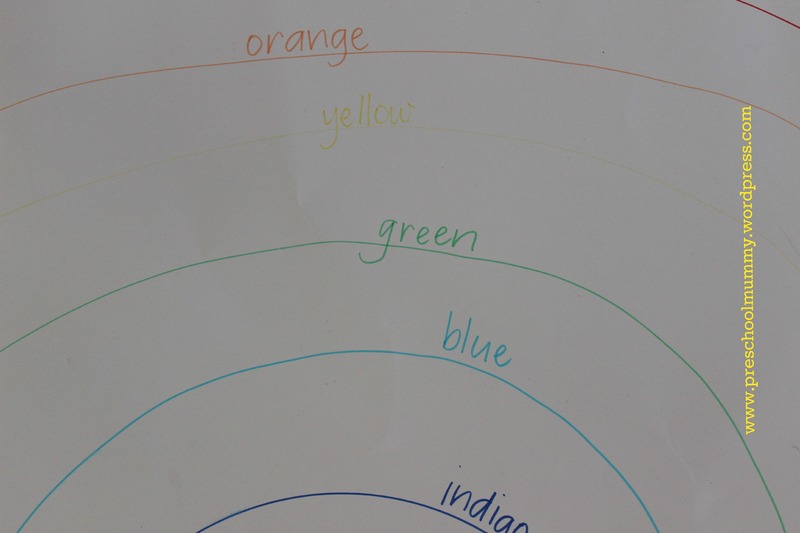 He did eventually notice that all the rainbows had the same colours and that there was no brown or black in the rainbow. Awesome! Next up I got out the packet of Crayola Washable markers and we put them in the same order as we saw on the screen. I had a big piece of posterboard handy so I held his little hand and we traced the arcs onto the page together. Next I explained I was going to write the colour names down. We sounded them out together and talked about the initial sounds of each word (o-0 for orange, letter o, sound o, what else begins with o sound? Off, on). Finally we talked about those pesky colour names Indigo and Violet, and he used his prior knowledge once more to tell me that Violet’s a name too, a girl’s name, from a book (Letterland). Then the song for his favourite program came on the TV and my little man jumped up, ran over and sat on the couch to watch, so I left the cardboard on the kitchen table and went to sit with him to try and get some awesome craft ideas from that silly chap we know and love, Mister Maker. Previous Post Rainbow Songs for preschoolers!